Bowls Oxfordshire ladies beat Bedfordshire by 6 shots in the Middle England League, played at South Oxford BC on Thursday 27th June. Points 11 for, 6 against. Bowls Oxfordshire ladies will face Kent in the regional finals of the Walker Cup (county double rink) on Sunday 14th July at Sutton BC, Surrey. Oxfordshire’s Middleton Cup aspirations are back in the team’s hands after coming away with a hard fought win against group leaders Hampshire at Atherley on Saturday. Oxon’s Mark Sykes got away to the best start, opening up a 10-1 lead over Leo May at five ends while the remainder of the games were closer during the early exchanges. The second quarter saw the Oxford team open up an eighteen shot lead with Captain, Alan Prew moving into a commanding lead over opposing skip, Jim Marsland, however the third undoubtedly belonged to the home side as they moved back within two shots at fifteen ends. Chris Daniels extended his early lead to eleven shots over Mark Charlett while the remaining Hants rinks all picked up important scores. During the final six ends Hampshire got their noses in front and could have then closed the game out had it not been for some dogged, as well as great, play from the Oxon men. Charlett’s four had struggled for consistency and results through the game but two three’s on the last two ends put them seven behind and Oxon four in front with just Paul Sharman to finish. It is becoming the norm for the Carterton man to be last out and this time he played a brilliant take out shot on the twentieth end for an invaluable three. A front toucher from Lee Young with his first bowl of the last end, great cover from Andy Martin and a jack trail from Barry Lambourne then followed. With Sharman just having to consolidate it meant that, despite his best efforts, Hampshire skip Richard Shelley could do nothing but attempt a dead end. Two misses, a five picked up, ten shot rink win and a nine shot, 16-6, victory for the county was the result which sets up a final day shoot out with Kent who eclipsed Middlesex by 20-2. 15 points at City & County on 6th July will mean a second successive quarter final appearance for Oxon although Kent will start as favourites given their vastly superior strength of numbers and the recent wins over their hosts. Oxfordshire Under 25s came up a little short for the second time in as many weekends against Surrey at Weybridge on Sunday. Having lost out in the White Rose regional final last week, the boys were looking to put things right as they took on their opponents in the Junior Home Counties League this time round however it wasn’t to be as they were defeated by 13 shots and 10 points to 4. A far more experienced Surrey team got out of the blocks early and raced to an eighteen shot lead at five ends which despite a concerted team effort by the Oxon team could not be fully bridged as the game progressed. They got back to seven shots at fifteen ends but no matter how much they gave could not sustain the challenge to the end. Gary May, with brother, Dean, Brandon King and Craig Maroney making a welcome return to the Under25s after a break from the sport, were Oxon’s best winning rink of the day. Having led from the start a deserved ten shot victory was the result. After the game Surrey manager Dave Clark commented on the strength of his own team but also praised the Oxon players for the way they stuck to their task despite being behind the whole way. Once again valuable experience will have been gained and the team now looks ahead to the clash with Sussex at Kidlington on 7th July. 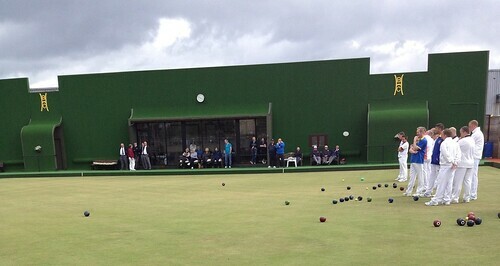 The Oxford and District Bowls league, sponsored by Yarnton Nurseries, reached the halfway point in the season on Thursday. Headington A’s comprehensive 5 – 1 defeat of Carterton now puts them in first place in Division 1. Wins for the rinks of Ian Snowdon, Mark Charlett and Howard Watts proving to much for the home side, despite Gordon Walker’s rinks efforts. City and County A’s comfortable victory at home to Banbury Chestnuts maintained their second place whilst Banbury Central A’s straightforward win at Witney Mills moved them into third place and pushed the home side deeper into relegation territory. Division 2 is still very tight and there could be major changes in the second half of the season. South Oxford A still lead the division, by a single point from Bicester, despite not playing this week. Division 3 is still close enough that, with the right results, any team could still be promoted or relegated. All four matches were also close this week. Chipping Norton’s ten point winning margin being the largest of the night. Wins by Stuart Davies, Keith Field and Peter Rathbone proving too much for the visitors, Bloxham, despite John Stephens valiant 16 shot victory for them. Oxfordshire Ladies beat Berkshire by 6 shots today in the Walker Cup (national double rink competition) played at Banbury Chestnuts. 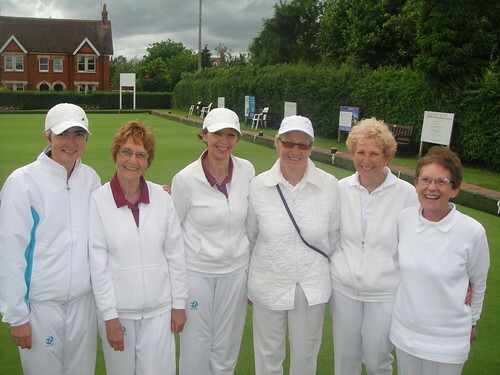 Ann Spearman, Carol Morgan, Donna Knight and Caroline Campion raced to a 16 – 4 head start at 10 ends over Berkshire’s Lilian Holliday while Annie Gilkes, Hazel Woodward, Jeanette Berry and Katherine Hawes were struggling to settle against Jane Porter and trailed 15 – 5. The game remained close with Berkshire closing the gap on Campion’s rink at 15 ends to just 7 shots with Hawes’ rink remaining steady to keep the score against them to 8 shots. Hawes’ rink finished first losing by just 8 shots and Campion’s rink had 2 ends to play being 3 up on the game. They held their nerve to pick up a single and a double to secure a victory for Oxfordshire. The regional finals will be played on Sunday 14th July at Suttons BC, Surrey. Oxfordshire 46 – Berkshire 40. 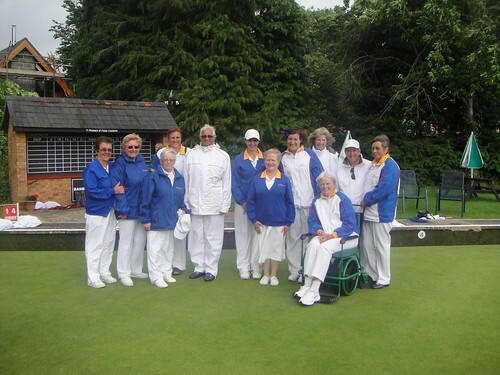 Teams skipped by Caroline Campion (Banbury Central) and Maureen Osbourne (Banbury Borough) have qualified for the National Triples Championships at Royal Leamington Spa in August. Campion along with Carole Galletly and Stella Amos are through after a narrow 2 shot semi final victory over Oxford City & county’s Donna Knight, Katherine Hawes and Gail Gilkes. The Banbury Borough trio Osbourne, Margaret Morris and Leslie Jones (sub for Angie Ives) beat Maggie Alderson, Carol Gaskins and Carol Penson (Oxford City & County) by 6 shots in their semi final. Quarter Finals: C Campion 19, A Gilkes 4; D Knight 22, M Plested 13; G Robbins 16, M Osbourne 22; C Penson 24, N Nicoll 1. Semi Finals: C Campion 15, D Knight 13; M Osbourne 17, C Penson 11. Brothers Robbie and David Clanfield have fulfilled a dream for their late father, Cyril, by teaming up with nephew Remy Clanfield to represent Oxfordshire in the Middleton Cup this season, writes Russell Smith. Oxfordshire’s Katherine Hawes helped England to victory in the British Isles Women’s International Series in Glasgow. Bicester moved up to third in Division 2 of the Oxford & District League, sponsored by Yarnton Nurseries. West Witney ran out 5-1 winners at Witney Mills in their Division 1 derby in the Oxford & District League, sponsored by Yarnton Nurseries.